Pink is the new black. : AT WORK: Save your arms by throwing your arms away. AT WORK: Save your arms by throwing your arms away. COMPLETELY REMOVE your chair's arms. Lowering them is not enough. You have no clue how many times you end up resting your bent elbows on the arm rests when you aren't paying attention. I've started paying close attention because of the, you know, shooting pain. It's absurd. It's second nature. We all do it. The only way to stop is to take the arm rests completely off the chair. Install a keyboard tray with angled rotation. With cubital tunnel syndrome, the main problem is the bending of the elbow. So the straighter you can keep your arms at any given time, the better, especially while working. The keyboard tray should be basically directly on your lap as low as it will go. 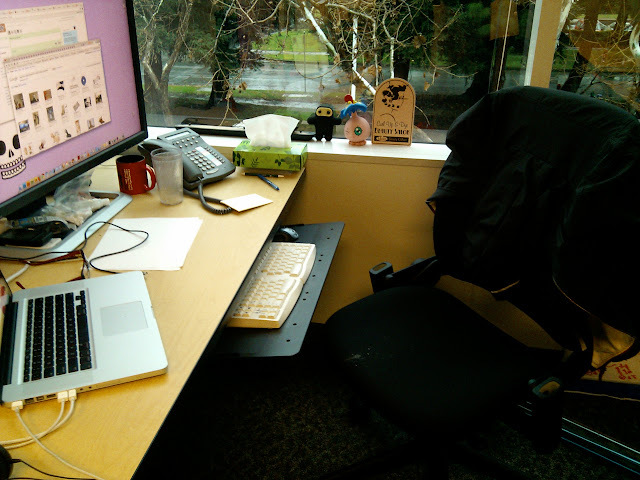 You may have to raise your desk an inch or so to accommodate this (I'm 5'7" and needed to raise it so my legs would fit). 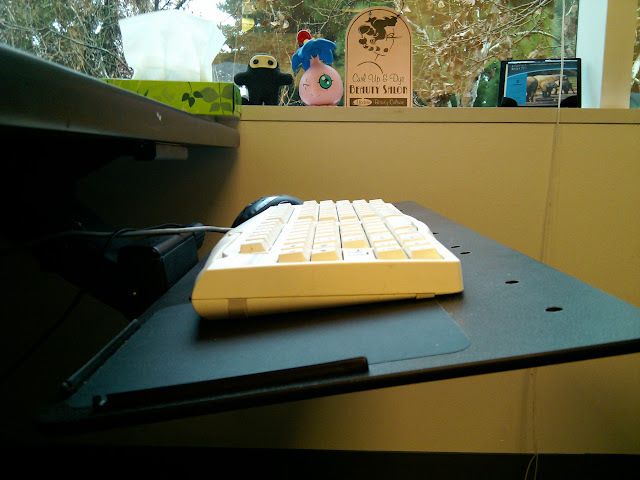 I have my keyboard angled away from me at a 15 degree angle so that my wrists remain in a neutral position (not cramped up back toward me) while typing and mousing. Don't forget to move your monitor to the right height! When your monitor is positioned on the desk, and you are sitting up straight with your feet flat on the floor, your eyes should be just above center on the screen. 15 degree angle keeps my wrists in neutral. So, wait.. why are you still reading this thing? Go do it! Fix your desk for good!